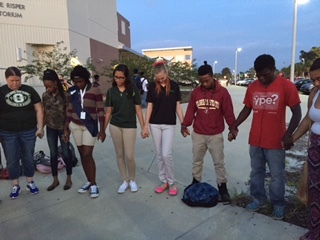 Today students across America got up even earlier than normal, splashed sleep from their eyes, and stood around their school’s flagpole—and prayed. I walked to the high school in our neighborhood, and met my friend, Ms. Rivera, head of discipline there. Her previous job was in a prison. She had invited me to attend See You At The Pole, and as we stood together with students, it occurred to me that SYATP has been around a long time. It was spawned in another era when the topic of prayer seemed more imbedded in the fabric of the culture. But don’t get me wrong, I’m not talking about the ‘good-old-days,’ because they were hard, just like now. Yet, back when a youth pastor and his handful of kids first stood at a school in Texas, which in turn led to a national movement, God was awakening Christians to the need for repentance, and the awareness that things had gotten so bad, that it was our only resort. This morning I asked God to bring to maturity a new generation, men and women whose voices would echo the heart of God, and take courage, and call this era to unprecedented vigor in the area of prayer. It’s easy to look around and bemoan, and it’s easy to judge, but it’s even easier to do nothing. Ms. Rivera also sponsors the Christian club. She’s there because she’s reminded every day of the pressures our children face, the stuff that they must face, with little to no resources, and the crazy junk in general they go through just because they’re teenagers. I have a theory. Teenagers pray with passion, because they’re closer to the pain of humanity than they will ever be. It comes with the territory. I think that’s what moved me so profoundly this morning. I watched these kids squint their eyes and clasp their hands, bow their heads, and cry out to God for Him to make a difference in their school. I stood there, and thought, they get it. I wish a generation of youth leaders, could ‘get it,’ too. Embers restart fires. Who will stir the embers now, and restart a movement of voices crying out to God to do what He intended all along to accomplish on our behalf? As we used to sing, it only takes a spark to get a fire going. And who is to say that these young men and women, with passion through their pain, won’t be the spark we all need to see true revival in this country? A picture of hope. Beautifully written, Kev.